While browsing around The Company Store searching for housewares, I was given an unexpected opportunity to review a product from their sister store - Company Kids. Little did I know at the time that there was more for our family at Company Kids. 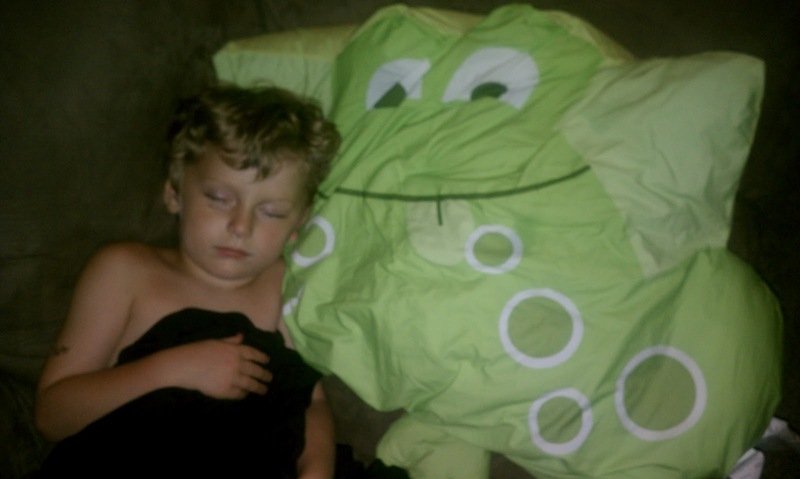 We were asked to review their Frog and Monkey Pillowcase Friends. My kiddos were super excited to add these adorable pillows to their bedroom and tent. Lately, the tent has become a permanent fixture in our living room. Not only does Dane sleep in it several nights a week but they absolutely love to play inside it like its a whole different world. The Pillowcase Friends match perfectly with each of their style and personalities and even goes well with their bed set AND tent. When the Company Kids pillowcases first arrived they had a rough feel to them but one wash did the trick. They are really soft and cuddly with lots of personality and no I am not talking about my kids although they are too! Both boys have not gone to sleep wherever without their specific pillow since they arrived. This is so strange for us because my kids have never shown an attachment to anything blanket, stuffed animal, nothing. Its been a new and cute exerience to see them enjoy playing with these so much! Company Kids offers all sorts of furniture, bedding, decor, luggage, toys, clothing and more. They have an extremely nice style and selection of about anything you can imagine for children of most ages. Company Kids supports charities such as Quilts for Kids, Living Beyond Breast Cancer, Ronald McDonald House Charities, Tuck a Child in for the Holidays, Haiti Earthquake Relief Effort, and Operation Homefront. Recommendation: I love love love my pillowcase friends! I also like so many other unique items from Company Kids that I want to buy. My only issue is most of the items are a little pricey of course for my taste although that doesn't mean you should be surprised to see a few more items added to the kids room! Giveaway: Company Kids is going to give TWO of A Lucky Ladybug's lucky readers a Pillowcase Friend of their own! My daughter would go nuts for the Frog Zoo Pack. That thing is adorable! I also like the Girls Flower Patch Quilt. I like their Brown Dot Explorer Luggage. I'd love to keep seeing giveaways like this... unique children's products. Would love for you to give away a bounce house! The Daisy Mae Reversible Comforter is cute. I would get any of the jungle animal items. My sons room is done in jungle animals.